The Brandywiners at Longwood Gardens: Kiss Me, Kate! Join your MIT friends at one of the area’s premier summer events, The Brandywiners’ annual production at Longwood Gardens' outdoor amphitheater. This year they are performing Cole Porter's classic Kiss Me, Kate! The Club has its own permanent block of seats (we chose the best in the house). They will sell out quickly so send your reservation soon! Your tickets will be mailed in late July. We also have optional dinner reservations at the Longwood Gardens Terrace Restaurant for their Terrace Barbeque Buffet before the play. 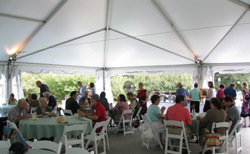 The buffet will be served in their huge outdoor tent -- a beautiful setting that has been a big hit the last two years. This is a fine opportunity to enjoy an informal summer meal, relax together after seeing the gardens and meet other MIT people before the play. The additional cost for the dinner is $31 per person. So, in our package we are providing a full day to peruse Longwood Gardens, a relaxing barbeque dinner together, and of course the Brandywiners performance, followed by a wonderful fountain display!